Disclaimer: Due to the nature of this film it is going to be difficult to review it without some mild spoilers. I will of course mark them out so you can avoid them, or if you just wish to see the film knowing nothing then bookmark this review and feel free to return to it once you’ve seen the film. 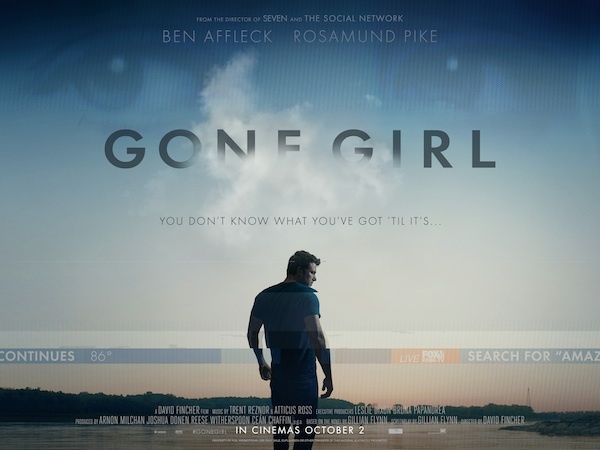 ‘Gone Girl’ is another brilliant example of how David Fincher can take almost any subject and make it an engaging, tense-filled experience and does it with the technical mastery of film making that I do so very much love from him. Having never read the book and only seeing the trailer once I went into Gone Girl not fully sure of what it was I was going to be watching and when I finally stood up from my two and a half hour stint in my seat I am pleased to say that the film was a success in my eyes. The thing that stands out to me the most in the film and the thing that stayed with me long after seeing it was the absolutely stellar acting by both Ben Affleck (Nick Dunne) and Rosamund Pike (Amy Dunne). Rosamund Pike in particular was brilliant in the film; she almost plays two separate characters and the transition from one to the other is seem-less and slightly frightening. There are points in her performance where it would be almost criminal to look away from the screen because she is just so captivating as Amy Dunne. Surprisingly Affleck himself does a great job in the film, usually a hit or miss actor for me (you’re never sure if you’re going to get Affleck from brilliant ‘The Town’ or if you’re going to get Affleck from the dismal ‘Jersey Girl’). Affleck is understandably carrying a large portion of this film and he does it very well, I’m almost tempted to say that this might be his best performance that I have ever seen him in. That may be in part because the character that Affleck is playing is someone I can believe him being, an out of touch, ego driven person who doesn’t particularly care for the people around him. He is simply great in his performance and I hope that this kind of standard continues onto other projects. The acting doesn’t stop there though; Gone Girl has a wealth of secondary characters, all of which are sufficiently fleshed out and very much keep the film up on its feet and moving. Two in particular that stood out to me was the actress Carrie Croon (The Leftovers) who played the sister to Affleck’s character (Margo Dunne). These two had brilliant chemistry and certainly brought some of the much needed laughs in this film, things can sometimes get a little depressing given the situation the film is dealing with. The other stand out cast member would be Neil Patrick Harris, though he in only in the film for a short time he plays a character that I personally never seen him tackle, that being a creepy stalker and there is something about the mannerisms that Harris infused into the character that sent a chill down my spine, it’s nice to see him in a very different roll that I’m used to. Due to the fact that I’m about to talk about my opinions on the overall plot in the film I will warn you now that it might get slightly spoilerish. So yes the plot in Gone Girl is certainly different, like I said earlier I had little to no knowledge of what was going to happen in the film and I’m glad that was the case, Gone Girl is one of those films where if you learn even one of the major plot points the film could be ruined for you (like the ending of the shining is the example I’d use). As each new revelation was revealed I just became more and more intrigued as to how it would pan out, this is a film that very much keeps you on the edge of your seat and this constant tension of what’s round the next corner is aided by the unsettling and Fincher-esque soundtrack (produced by Trent Reznor and Atticus Ross). However I was not completely satisfied with the films ending, the film builds and builds and it feels like it is going to have an out of left field, crazy ending and instead what happens is it gives you a big revelation and then just cuts to the credits. That left me slightly annoyed but up until that point I was fully engrossed in every perfectly shot scene that Fincher had to offer me. I don’t feel there is much else I can say about this film without needing to go into full on spoilers, this is just one of those films where it is nigh on impossible to speak about unless everyone has seen it so I may return to this film later on when I know more people have seen it. So what I will say is that you should definitely see this film, if you love David Fincher films then you’ll love this and if you’re looking for a film with an entertaining, edge of your seat plot then this is certainly the film for you. Whatever reason you need to tell yourself so that you go see this film say it and then go this is another brilliant film by the always tremendous David Fincher. A strong review on a fantastic piece of cinema. For me a posible contender for the best picture oscar. I’d give it five glasses °° out of five.